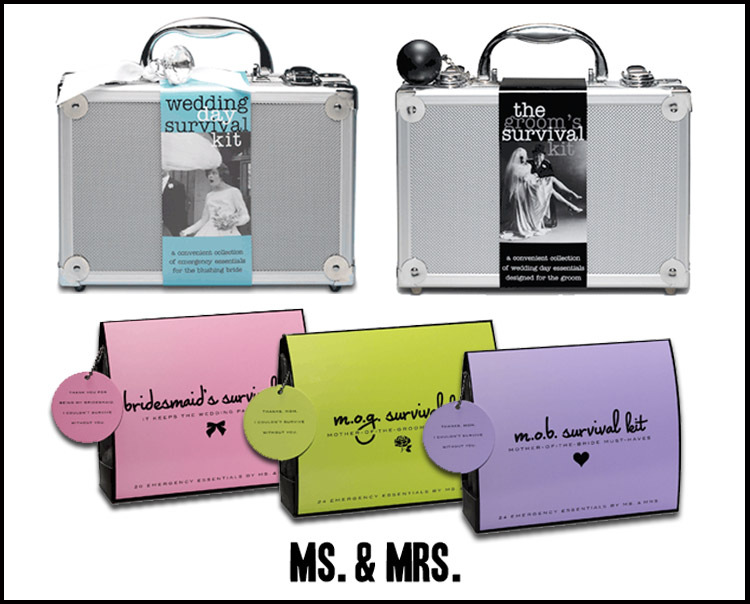 Because every bride wants their day to be flawless and as stress free as absolutely possible, we’ve found these must-have survival kits brought to you by Ms. & Mrs.! The Wedding Day Survival Kit includes 30 day-of essentials including a mending kit, safety pins, double-sided tape, mints and more. While the Groom’s Survival Kit includes a more “manly” collection of stain remover, wrinkle remover, black socks and a stress ball…for those last minute jitters! They’ve even thought of your bridesmaids, the M.O.B. and the M.O.G (aka mother of the bride and mother of the groom). Every picture will be perfect with water proof mascara and tissues as part of these 24 piece kits, sure to keep teary eyes intact! Find select Ms. & Mrs. products locally at Bella Bridesmaid in Dallas. « Previous Post: Upcoming Events in DFW!